Going into the third day of New York fashion week, a collaboration of Indonesian designers from Indonesia Fashion Gallery. Designers 2Madison Avenue,, Alleira Batik, Dian Pelangi, and Itang Yunasz presented their collections in Greenwich Village’s Industria Studios on a chilly, gloomy, ordinary February morning in Manhattan. The wet weather and the rush hour traffic didn’t stop photographers, reporters, stylists, and fashionistas from all over the globe arriving over an hour early to stand outside in anticipation of the show, sure to be a modern, fashion-forward take on Indonesian garments. The show cast with bright, gleaming lights and flashing cameras all around, focused on three central ideas: redefining traditional Indonesian fashion, creating luxurious pieces for everyday wear, and offering homage to street style. 2MadisonAvenue, a brand born from a dream, by designer Maggie Hutauruk is known to play with 100% handmade fabrics, resulting in a boho chic style for the everyday elegant woman. Her collection for the show presented her as subverting tradition by playing with proportions and patterns. One of the largest Batik retailers in Indonesia, Alleira Batik was the second designers presented at the show. With the objective to illustrate her vision of traditional batik as a beautiful luxury that can be worn by the modern woman, the brand sent down the runway models cast in vividly colorful layers and fluid skirts sweeping across the floor touching upon the ankles of cross-legged observers under brim limelight. New York Fashion Week saw the anticipated return of Dian Pelangi, marking the show with models walking in all hijabi looks, adding a freshly modern twist to the conservative convention. 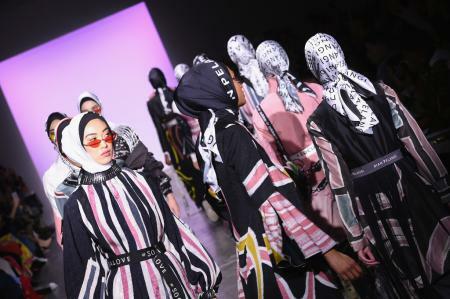 The global fashion brand, widely known and loved across Muslim fashion, opened the show with models being cast down the runway in modestly simple and relaxed skirts, paired with varying prints in waist hugging silhouettes. The looks were accessorized by glowing yellow shades, casual sneakers and a palette of rouge lipstick. Itang Yunasz’s, one of Indonesia’s most famous designers, demonstrated a clear focus on detail and culture that transferred energy and power to the show. The collection was reflective of custom and highly decorative, yet casual, suitable for everyday looks. Yunasz made his collection and therefore his vision for the upcoming fashion all about freshly polished and refined gown and headdresses, deftly working an inspiring theme in a commentary on chic control in prints, color, and varying silhouettes.